Today Holy Mother Church celebrates the feast day of St. Germaine Cousin, the patron saint of abused children. Germaine was from France, and there she long endured tuberculosis and a deformed hand as a child. Worse, she was abused and neglected by her father and by her stepmother. Her stepmother forced her to sleep in a cupboard and had to eat scraps from the garbage. She was not fed real meals. Her stepmother also beat her and poured boiling water on her. Story goes that, while she was working in the fields, the farmhouse was nearby a church. 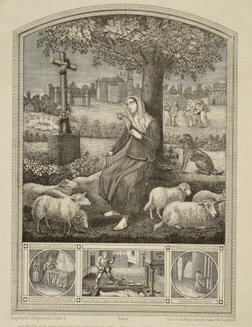 Whenever she heard the church bells ringing, she would throw her staff on the ground and pray to her guardian angel to watch her sheep in her absence, and then she would go off to Mass. I think we could all stand to pray for abused and neglected children. There are so many things that irritate us, but put those problems next to something like abuse, and we will realize that we ought to just shut up. Join me in this prayer, will you? St. Germaine Cousin: pray for us and protect the abused! This entry was posted in Prayer, Reflections, Saint Quotes, Saints. Bookmark the permalink. Seems like a catholic version of “a child called it”. Wow, Kevin, you are SO right… I had to watch a movie about the “child called it” in one of my sociology classes. I actually had to watch a lot of movies like that one in that class. Funny thing about that class though, is that it turned out to be one of my very favorite classes I've taken so far. If I wasn't so passionate about teaching, then I probably would have majored in Sociology. Random side conversation here, so I think I better stop it here…. Needless to say, that after reading that it's no wonder she became a saint. Any child that has had to go through something like that deserves sainthood.